Like some of you, we cruise eBay from time to time. Today we came across a clean and very low hour Kubota L2800. The L2800 is a 30 hp tractor and this one comes with a LA463 loader already installed, 4WD, a ROPS and only 206 hours on the clock. Another nice thing about this auction is that it seems the seller is willing to help out coordinating pickup and delivery. Some sellers do not want to concern themselves with this last part of the sale and insist on local pick-up only, so this is good to see here. Currently sitting at 6 bids with high bid at around $2,500. Reserve is set at $12,750 which is pretty fair considering that this tractor sold north of $16,000 brand new without a loader only a few years ago. 5 days remaining! If you’re interested contact Daniel Weeks directly at daniel@tripleddd.com or check out his auction on eBay here. 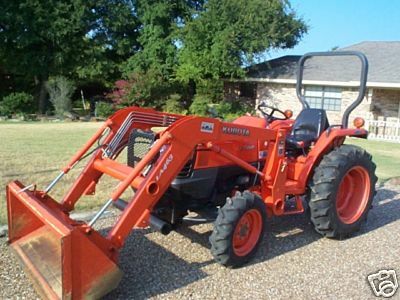 Update: Daniel ran a successful auction and sold his Kubota! Someone got a fair deal on a great looking tractor. Proof that a Kubota in good shape with some clean pictures will find itself a new home on line. Nicely done!